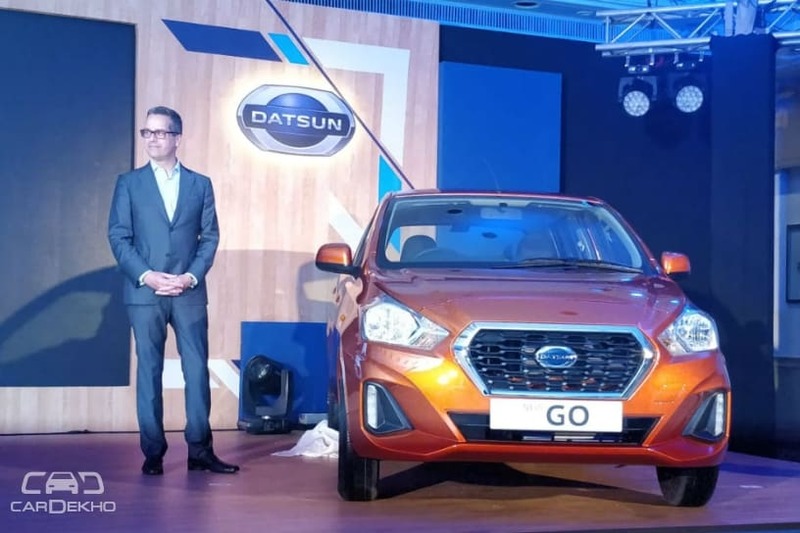 Datsun India has launched the GO hatchback and its seven seater version, the GO+, in India today. The two look a bit more upmarket on the outside and feature decent upgrades on the inside. Prices for the GO start from Rs 3.29 lakh and go till Rs 4.89 lakh whereas the GO+ commands a price tag of Rs 3.83 lakh to Rs 5.69 lakh (ex-showroom Delhi). Both the cars are now available in five variant choices each instead of the earlier four. Let’s take a look at the pricing along with the difference from the pre-facelift models now. Here are the updates on both the cars. Datsun GO and GO+ receive an updated set of bumpers which are fitted with LED daytime running lamps up front. Bigger 14-inch diamond cut alloy wheels equipped with fatter 165/70-section tyres replace the 13-inch 155/70 steel wheels on the top-spec variants. New colour options: Amber Orange for the GO and Sunstone Brown for the GO+. Both cars get a slightly redesigned dashboard. The GO+ receives a two-tone finish. The front seats get a conventional setup in place of the connected layout seen in the older version. Both cars get a floor-mounted handbrake instead of the pull-type lever offered before. The biggest draw, however, is the new 7-inch touchscreen infotainment system. It features Apple CarPlay as well as Android Auto connectivity. In a bid to aid more convenience, Datsun has added rear power windows and wiper with washer to the feature list. With the upcoming BNVSAP (Bharat new vehicle safety assessment program) kicking in next year, the GO siblings are equipped with dual airbags, ABS with EBD, brake assist (BA), driver seatbelt reminder and rear parking sensors as standard fitment. Under the hood resides the same 1.2-litre, 3-cylinder petrol engine which churns out 68PS and 104Nm of torque. As much as we would like them to have, Datsun has refrained from introducing a CVT or AMT gearbox. Thus, the transmission unit still remains a 5-speed manual gearbox like earlier. The Datsun GO rivals the likes of the Maruti Suzuki Celerio and Wagon R along with the Tata Tiago and the upcoming Hyundai Santro, which will be launched on 23 October 2018. There is no direct competitor to the Datsun GO+ as it is among the most affordable 7-seaters in the country right now.